All the gas grill reviews that we've done over the years are listed below so that you don't have to trawl through pages and pages of information. If you've arrived here then you've probably already made up your mind that you want a gas grill, after all, for many people the availability of immediate heat is what swings it. Whenever the fancy takes you, you can fire up a gas grill and be cooking in a matter of minutes, no worries about planning for the weather, just get out there and grill. Technically speaking, the modern designs with flame tamers (as opposed to the old lava bricks) make gas grilled food taste almost as good as anything from a charcoal grill. 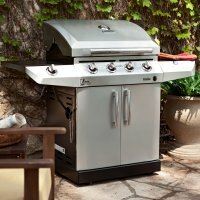 What Makes A Good Gas Grill? Sadly, it's pretty much impossible to judge absolute performance and "cookability" from the showroom or website so a verbal recommendation or an opportunity to cook on one before you buy is valuable. That said, there are five key factors that I look at when evaluating a grill. The number of burners (and their position) in the grill. This doesn't mean that more is better but having burners positioned in different areas of the grill gives you flexibility to create different heat zones. The fundamental being the ability to both direct and indirect cooking. How far are the burners positioned below the cooking grate? If it's less that 100mm or 4" then frankly I wouldn't bother. It's my pet hate about gas grills - cooking in flames so everything is burnt on the outside and still raw in the middle. Yes the better quality manufacturers are gradually increasing the distance between the burners and the cooking area but on lower quality grills the burners are still too close to the cooking grate. This is a fundamental difference between a £200 grill and a £500 grill. Just having flame tamers between the burner and your food is not enough of a barrier. Note: Many gas grills suffer from a cold spot at the front of the grill and some of the better quality manufacturers (eg Bull & JensenGrill) have designed their flame tamers to eliminate this problem. Gas grills look shiny and new in the showroom but after a good Summer workout then without a good clean they won't at best be so sparkly and at worst won't work at all. The most common symptom is an orange flame and black soot when cooking. 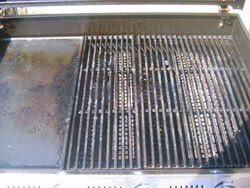 In order to clean a gas grill you need to be able to take the grill components out and wash them. How quickly & easily can you remove & replace the the flame tamers? How quickly and easily can you remove and replace the burners? These components should have easy release mechanisms, not nuts and bolts in completely inaccessible places. I love asking the question about the warranty on the burners because it's usually the burners that have the longest guarantee. Call me a cynic but I bet your grill will fall apart before the burners do. 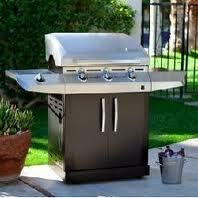 If your burners have a one year warranty then expect to buy a new grill every 2 or 3 years. If your burners have a 2 year warranty then you may get 5 years use out of your grill. Look at it this way and do your maths, it pays to save up a bit more cash rather than only buy what you can afford today. If you're looking for a stainless steel grill because you want rust protection and longevity then scrutinise everything and take a magnet with you (a magnet will not stick to good quality stainless steel). A top quality stainless steel gas grill will be made exclusively from type 304 stainless steel - see our guide to stainless steel. Using stainless steel sheet and non stainless nuts and bolts (which will rust). If you're stainless steel grill is made anywhere other than a low cost country and is welded then as a general rule of thumb you're onto a good thing. That said, you will have to spend significantly more to realize this level of quality. Is it battery or mains electric? Depending on where you plan to site your grill this may be important. After all of the above, check out the features and accessories. Get the quality right by choosing the best manufacturer you can afford and then select the model with the features that most suit you. All our gas grill reviews below have been designed to give you a summary of all the positives and negatives that we've either read about or heard of regarding the grill in question and we've put this into one easy to read page so you don't have to trawl the internet for hours. Jensen Grill - This gas grill takes charcoal too! 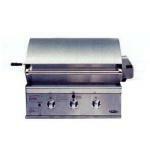 In addition to all the gas grill reviews above I've also got a separate section for hotplate grilling equipment. These are all fueled by gas but rather than the cooking happening on a grate and heat applied underneath, these grills rely on the gas burners heating up the hot plate. 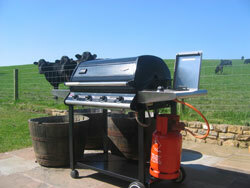 Beefeater barbeques are the Australian BBQ success story. There are two ranges of gas barbecue grill, the porcelain enamel Discovery series and the stainless steel Signature series that culminates in a complete outdoor kitchen center. When I looked at the Beefeater range what impressed me most was the build quality, certainly superior to other grills in the price range (including Weber grills) and overall very good for a mass market manufacturer. Clearly we're not at the standard of Fire Magic gas bbq grills, but we're nowhere near their prices either! 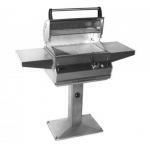 The links below will take you through to the best prices that I've found on the complete range however however if it's a built in grill that you're looking for then there are some pretty startling prices on selected grills here. This is the entry level to the Beefeater barbeque range however there's very little difference between the 900 series and it's more expensive stablemate (the Discovery) in terms of functionality. The price differential is essentially down to the chosen materials of manufacture. This is a solid piece of kit featuring 4 cast iron burners (56,000 BTU) and a side burner (14,000 BTU) that sits on a powder coated steel trolley. Don't always think of powder coated steel as being inferior. If well looked after it can look a lot better that stainless after a few years of use. The Beefeater Signature range is where we go fully stainless steel with the 2 and 3 burner Signature Plus units placed on a pedestal with side shelves and a telescopic towel rack whereas the 4 and 5 burner units sit on a stainless steel trolley and include two condiment racks. 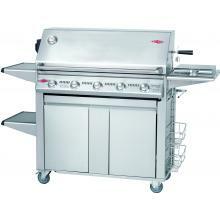 All these Beefeater barbeques have the option of a side burner, the same guaranteed rust free cook tops and are complemented by Quartz start technology that makes for cleaner ignition without the need for a battery. Top the Beefeater barbeque Signature range is the SL4000 series and captures everything that the Signature Plus range has to offer in a built in unit with 6 burners and an optional trolley with ice bucket, waste bin and paper towel holder. The Blue Ember gas grill (500) is loaded with features and the one I like best is the adjustable (3 position) cooking grates that give you great flexibility – high, low positioning gives you intense or lower heat functionality (depending on what it is you are cooking and how you like it cooked). I've had a feature like this on my homemade grill for many years and it serves me well. It doesn't matter what manufacturers say about the technology for eliminating flare ups, there's nothing better than a bit of height when you are grilling anything that's going to drip a fair amount of fat. With the 3 main burners producing 45,000 BTUs there is a lot of power to satisfy most chefs’ requirements. A close second is the large cooking/working area – plenty of room to manoeuvre. Then there’s the ‘gadgets’ such as the condiment tray, wine bucket and cart mounted bottle opener. The manufacturer’s have clearly ‘set out their table’ when it comes to positioning the 500 in the market place. A lot of grill for not a lot of money (relatively speaking). 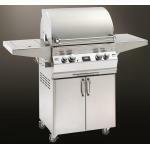 Economy does come at a price, though, namely that the Blue Ember gas grills are made from lower grade stainless steel. To be fair this isn't uncommon to many mainstream grill manufacturers this really applies to all grills - if kept outside year round you grill is subject to rust. But if you treat this baby well – buy a good cover and shelter it from adverse elements you will get a good working life from it. Note: Neglect this grill at your peril, ‘cleanliness also equals longevity’. The grease drip tray is removable and a regular scrubbing with soapy water works wonders. A word of advice from the manufacturers - light the left burner first to allow the gas to get all the way down the lines. I find this more than a little annoying, why can't there be a separate ignition for each burner? I guess the counter argument is price and reliability. Incidentally if you buy any Blue Ember grill then they are now made under the new ownership of the Onward Manufacturing Company (makers of Broil-King and Huntington Grills) and carry a 7 year guarantee. Ideal for family gatherings and parties. 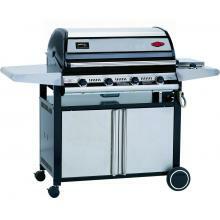 How do you choose from the complete range of Brinkmann gas grills which one is right for you. To help you I’ve included some examples below of the grills available but before that let me explain where to look for differences. The further up the range of Brinkmann gas grills you go the more weather protection for the grill and therefore the claims of durability. The other significant differences are the power of the burners, whether the inner trays are porcelain coated for ease of cleaning and then after that it’s about additional side burners, ice boxes etc. Also the further up the Brinkmann range the larger the cooking area but even the most elementary models feature the handy one touch electronic lighter for easy lighting and a durable temperature gauge. 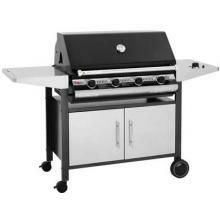 Brinkmann also claim that no tools are required to assemble your new grill. 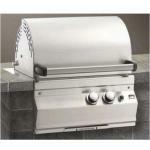 Heavy Duty Gas Grill features a stainless steel hood with cast iron aluminum end caps. Here is our Charbroil gas grills review 2012 included the latest infra red grills, how they perform and where to buy them. It has two 7.5” rubber rear tires so is easily movable along the horizontal but lifting it vertically requires some effort still (remove the two ice-coolers before attempting the latter). It packs away neatly simply fold in the side shelves, pull out the carry handle and it becomes readily portable – rather like the ‘rolling’ suitcase that air travelers use. Excellent for storing away in those more confined spaces. Being already part assembled when it arrives with you it's a somewhat easier assembly than many other Charbroil gas grills. This grill is infrared meaning there are no exposed flames and the Grill2Go Ice directly heats the food and not the air surrounding it. The food is therefore seared (locking in the natural juices and flavors) so you can cook relatively quickly without fear of flare-ups. Warm up time was a bit longer than Charbroil state, allow about 5 to 10 minutes longer than advertised but other than that I found this to be a great little portable gas grill. Ideal for some cooking for themselves, a couple or small gathering, dedicated to those who want to grill on the move. If your desire in Charbroil gas grills is for something compact but extremely functional then you won’t go far wrong choosing the M340IR. It comes with the Char-Broil patented Surefire Electronic Ignition and what I loved is that each burner has its own temperature gauge with the heat being measured at the cooking surface so you can really get your grilling down to a fine art. It's the same principle as the Spanish "plancha hotplate grill", the direct contact heat ensures an evenness to your cooking and that fact that it's infra red just makes it that much more state of the art. Quite rightly the manufacturer has a reputation for designing stable grills and the M340 is no exception. To my eye it is also one of the most attractive, solidly made from shiny stainless steel (not top grade) with equally solid grey/black side tables that fold neatly when put away. It’s the Quantum infrared and open-flame heating that make this grill stand out, it's great for searing meats and in my experience it is also extremely economical with the gas lasting for ages. It's a small negative but expect to have to clean it after every half dozen or so outings. In conclusion I would say that if you aren’t worried about impressing the neighbors with a huge all singing, all dancing piece of kit then you can't go far wrong with this unit. 2 burner, 340 sq. in. Once assembled and you take a step back to admire the M500 Char-Broil gas grill your eye confirms that yes it appears sleek and well-designed aesthetically in the flesh as it did on the website. You instantly imagine yourself standing before it, barbecuing like a true professional, surrounded by admiring friends and family. One note of warning though. 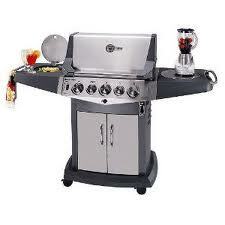 This is not one of the Quantum infra red Charbroil gas grills, it has traditional burners. OK that's reflected in the price but when you consider that the IR unit is only $70 more and much more economical on gas you have to ask yourself whether this grill represents value for money over the long term. If you are going to use your grill a lot then gas consumption will be a bigger consideration and you might want to move straight onto the M500IR below. I heard of a complaint by one person that the grill surface could be easily scratched by using a metallic spatula, well it's hardly likely that the grill will stay pristine forever but to help matters along use a spatula made of solid plastic. Having said all the above, this is still an impressive grill. There was a thermometer in the lid (as you should expect) but I would have liked the side burner to be on my right (probably because I am right-handed). Ideal for large family gatherings and parties. Cooking surface: 500 sq. in. ; Warming rack: 180 sq. in. Like the M500 above (and all Charbroil gas grills if I'm honest) this infra red grill is very sleek and pleasing to the eye. Charbroil claim that the infra red grills use up to 30% less fuel and this is down to the fact that your food is in direct contact with the heat, there's no air to heat in-between. If you are an all year round griller then this is worthy of consideration because the difference in gas consumption will be more marked the lower ambient temperature is. Indeed this baby can clock to over 700 degrees Fahrenheit, which is a substantial amount of heat in anyone’s book. Searing steaks, fish and seafood is the absolute staple of infra red, it performs this duty supremely well and with separate thermometers at grill height for each burner you get perfect control. Crank up the heat for a few minutes then lower the temperature for another few minutes to get the best results. I still use my charcoal grill for slower direct cooking but if gas is your thing then this grill takes a lot of beating. Note:- All Charbroil gas grills come as self-assembly but even though the parts are numbered and the instructions really simple to follow, it does take longer to put together than the manufacturer states. Grill Parts Guys and they seem to stock just about anything and everything and not just for Char Broil. Once you navigate to the Char Broil area of their site you'll see a list of all the models. All you have to do is click on your model and it brings up a new page with all the spares for that unit. The range of Coleman Roadtrip grills isn't large because the products are targeted to a very specific niche and that's camping. Coleman markets itself very much as an outdoors company, manufacturing camping accessories and tents amongst other things so grills are just a part of the the range. What does that mean? I would expect a BBQ manufacturer to focus on flavor and creativity from the point of view of the outdoor chef and BBQ enthusiast. I would expect a manufacturer of camping equipment like Coleman to be more into the practicality and portability of a piece of cooking equipment. Certainly it's true that practicality and portability is the name of the game but how do the Coleman grills stack up? When you think that this Coleman Roadtrip Grill weighs only 41 lbs (Grill: 24 lbs Stand : 17 lbs) you can see why this would be a popular buy for those who want a portable, easy to transport barbecue that folds up neatly and goes from your vehicle to cooking in a heartbeat. The compact foldaway design that fits into your car also makes for ease of storage back at home. As the stand is completely detachable you can also use it on a table or counter top. An added advantage is that the lid detaches to accommodate large pots and pans but locks securely during transportation. The grills look like an ironing board and perhaps not surprisingly they collapse in the same way that an ironing board does making them very easy to carry around. Sure enough the Coleman Road Trip Pro is extremely easy to set up and is made from high quality materials. Available in a custom black finish with chrome accents it looks, in my opinion, quite attractive. Brand new they look the part but when you come to actually look at the grill technology it's pretty basic, a heat source under a cooking grate. So yes, it's going to cook your food but no, it's not going to add much char-grilled taste. Coleman sell this simplicity as flexibility because your Coleman Roadtrip grill can be used as a grill, griddle or stove. Most importantly it provides good heat and that’s down to the 22,000 BTU total heat produced by its 2 independent burners. The manufacturer’s claim a consistent cooking performance even in cold weather, high altitudes and when fuel is low. Clean-up also looks to be a bit of a challenge, especially when thinking about folding it up and grease coming out as you up end it. Many people recommend lining the the inside with foil prior to your cookout and I would agree with them. What you see is what you get. A much often quoted statement and when it comes to the Coleman Gas Grill known as the ‘Party Grill’ it rings true. It does seem misleading to call it a ‘Party Grill’ as you immediately imagine yourself standing behind an enormous grill catering to the entire neighborhood. Wrong! The grill is in fact ideal for the sole griller. Speed and practicality abound though, it takes only about 10 minutes to put together (no tools required!) and you can sling it in the back of your vehicle and be grilling your burgers within a jiffy of having arrived at your destination. It also has the benefit of being able to use it for boiling (having removed the grill and replaced it with a suitable pot). It feels good and stable if set on a solid surface. A criticism leveled at this grill is that most of the heat is focused on the center but once you know this then you can adapt your cooking to suit. An upside not always mentioned is that the Coleman Roadtrip grill ‘PerfectFlow’ regulator does provide consistent cooking performance by producing a steady fuel stream, even in cold weather, high altitudes or when fuel is low. And heck just look at the price! There is a small griddle on one side of the grill to cook an egg or two and it comes with a nylon carry-bag (included) for keeping the parts together - giving it a couple of extra bonus points. Ideal for the sole chef and taking out ‘on the road’. It's a practical flexible cooking tool, not a high end grill. 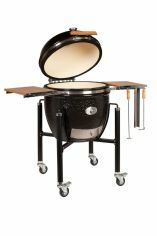 If you are the outdoor BBQ pro then the range of DCS barbecue grills is for you. They come in 3 basic sizes with both natural gas and propane options, free standing or counter top and a range of extras. What makes DCS grills stand out from much of the competition is that they are made from type 304 stainless steel - a high quality stainless with a significant nickel content. Using this better quality steel makes welds stronger so the overall durability of DCS barbecue grills is going to be that much better. If you look at any stainless steel grill in a warehouse store then guaranteed it will be made from lower quality 430 stainless and it will be fixed together with bolts rather than welded. Again, it won't be immediately apparent but things like the nuts and bolts used to fix a cheaper grill together will look bright a shiny but they won't be stainless steel. With these fastenings you won't notice any difference for the first 6 months until your cheaper grill starts to corrode - and it will be the bolts that go first. The last point to make about DCS pro gas grills is that they are all hand crafted. It's differences like this that set the DCS barbecue grills apart from their competition, but then that's reflected in the price too. Below is a brief resume of the key features of each of the sizes in the DCS range, just click on the pictures to access reviews and more information should you be interested in buying one. 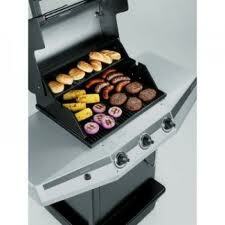 The baby of the DCS grill range is by no means second rate. Started by a 9V battery ignition system it powers 2 burners with a power consumption of 25,000 BTU / hour per burner. There’s also an infra red rotisserie system that can take up to 50 pound weight of food and provides controllable searing. For night time grilling DCS have a patented Smart Beam grill light integrated into the rotisserie motor that lights up the entire grill. 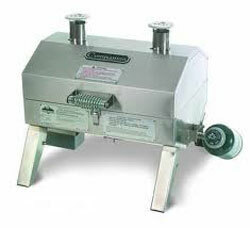 Additional features include a removable stainless steel drip tray and stainless steel warming rack. Other than the obvious increase in size the 36 inch DCS grill offers the patented Grease Management System that actively channels grease and oil away form the burners to minimise flare ups. The 36 inch unit as includes a smoker tray with 35,000 BTU / hr burner. You don’t get much bigger grilling surfaces than the DCS 48 inch gas grill. This range includes everything on the smaller grills but also has the option of a side burner. DCS are a well established manufacturer of kitchen products as well as outdoor grills and they don’t stop at built in grills, there's also a great range of on cart gas grills. They also do outdoor refrigeration equipment and patio heaters too. 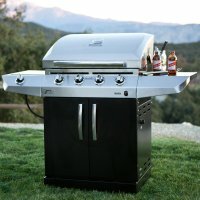 Ducane gas grills are now a brand in the corporation that we know as Weber-Stephen Products Co which has it's good points and possibly some bad points too. The grills are now made in China which means that they will be competitively priced although some of you may be turned off from this with potential quality concerns. 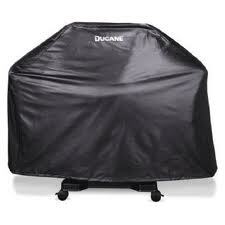 All I can say at the moment is that Ducane gas grills are backed up by the Weber 5 year limited guarantee. Below you'll find the reviews so far completed of the Ducane range. Each review has been carefully constructed using our knowledge of the grill together with a crystallization of site reader feedback to give you a balanced view of what the grill is all about, whether it's the right grill for you and bottom line, where can you get the best price. Assembly instructions for the Affinity 3100 are totally pictorial and putting it all together took about an hour so long as you don’t make mistakes – such as making sure you have the right component parts matched up to the pictures (or you'll find yourself going back to the beginning again like I did). One piece of feedback we got was disappointing in that the material on the side tables and the grill lid isn't as solid as you would imagine (based on the online photographs) but this is inevitable when building a grill to a budget - that's why it is made in China. Likewise the use of multiple languages in the instructions is a bit annoying but these days it’s a fact of life when a single low cost point of manufacture is servicing a global market. Having said all the above what about the three most important qualities you require from (any grill let alone) Ducane gas grills? Heats up fast and hot? CHECK. Easy to clean? CHECK (If you leave the grill heat on HI for 10 minutes after cooking). A grill for this price that's manufactured by Weber, hasn't it got to be worthy of consideration. 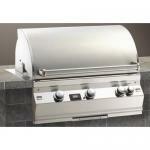 This 3 burner gas grill is ideal for smaller family gatherings and parties. The Affinity 4100 has to be one of the best lower priced models available in the 4 burner range from Ducane gas grills, on this occasion Weber-Stephen Products Co have done a pretty good job on price without too much reduction in quality. Big brother of the Affinity 3100 (the 3 burner model) it carries the ever reliable, no fuss, Weber 5 year limited guarantee. It is in the materials used for the external construction that you could accuse of being ‘somewhat thin’ but Ducane / Weber certainly don’t seem to have scrimped on the quality of the internal components. The propane model we looked at moved around on its caster wheels (2 fixed + 2 swivel) with ease and it performed pretty well too. There are no ‘hot-spots’ giving a lovely even heat. In summation then, if you want a budget gas grill that is ideal for family gatherings and parties and aren’t worried about all the ‘extras’ then look no further than the Affinity 4100 Ducane grill. A low cost grill backed up by Weber warranty has to be a winner. Let's be honest, we've agreed that Ducane gas grills aren't expensive and as such your grill's good looks and durability will probably be compromised unless it is properly protected from the elements. Not only does a grill cover keep your barbecue looking good it protects it from moisture ingression and therefore rust - a grill's biggest enemy. Any rust around the burners will affect the performance of the grill in the long term and you'll start to notice it when you flames burn with an orange tinge rather than the blue that you had when you bought the grill. If you have already got to the stage that I'm describing and are looking to buy new burners then make sure that a grill cover is on your shopping list to stop you throwing away more good money. The manufacturers state that their heavy vinyl construction defends against snow, hail, rain, sun, and wind hazards while warding off the additional spiders, pests, and assorted debris that often infiltrate barbecues and pose fire dangers and I have no reason to disbelieve them. The full interior felt lining prevents scratches to the grill's exterior and even absorbs any residual moisture on its surface. I liked the fact that velcro side straps are used to secure the cover over the grill. 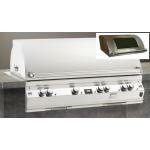 The cover fits the following Ducane gas grills - 1305, 2005, 455-inch, and 688-inch gas grill models. To clean the grill cover simply hose down with water. From the Ducane grill parts list you might also want to consider Ducane’s small drip pans. These foil liners for the grease catch pan come in packs of 10 and are 5.67" x 7.56" in size. The range of Fire Magic gas BBQ grills is for you if you're looking for professional quality barbecue construction dedicated to enhancing the enjoyment of your outdoor life. The majority of the range are gas powered and I’ve covered them on this page but Fire Magic do also manufacture a range of charcoal grills and a smoker too. 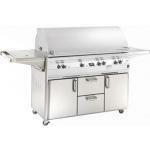 Grilling performance and durability is underpinned using a stainless steel welded body. This is top quality type 304 steel, not the type 430 that you see on most grills in the warehouse / sheds and in a nutshell, it costs more use and it costs more to weld. The quality type 304 stainless means "no rust", the fact that it's welded means "no rust", this is what you are paying a premium for. Other features include cast stainless steel burners, heavy-duty comfort touch knobs, push button solid state electronic ignition and heavy-duty double wall stainless steel hoods. 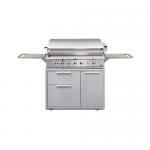 Uncompromising heat and superb cooking control make the Fire Magic Echelon gas grill stand out from the crowd. Similar to it’s smaller stable mate Aurora the Echelon boasts the cast “E” burner system that gives you control together with a uniform spread of heat. Hot and cold spots become a thing of the past. Practically speaking there’s some neat ideas gone into the Echelon such as a handy storage space for your rotisserie bar and a multi sensor digital thermometer. The Echelon also has a wood chip smoke drawer with an independent burner so you can smoke on this unit too. And wait for it! 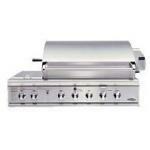 – If you’re the supreme barbecue chef poseur the top of the range E1060 even has a power cooking hood. Just push the remote control button and watch your gadget pals laugh in amazement. The Aurora gas bbq grills from Fire Magic represent the top of the range and caters for most requirements with an excellent standard of equipment and a range of sizes of cooking area. The range of sizes is listed below and that should give you a guide when looking through the range as to which one is best for you. Click on the links to find more information and up to date prices. The A430 provides 432 sq inches of cooking area. The A530 provides 528 sq inches of cooking area. The A540 provides 540 sq inches of cooking area. The A660 provides 660 sq inches of cooking area. The A790 is a built in grill providing 790 sq inches of cooking area including a powerful rotisserie. The A830 offers dual source (gas and charcoal cooking options). 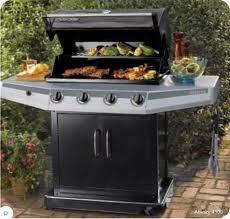 In terms of the features, you get an awful lot more than the entry level Legacy gas BBQ grills. Stainless steel construction is standard of course and then you’ve got the added features below that really make this the complete unit. Exclusive cast stainless steel "E" burners ensure that there’s an even spread of heat – no hot or cold spots. These burners have a lifetime warranty. Stainless steel rod cooking grids. These provide a non stick surface that doesn’t wear out. All of the above gas BBQ grills come in either freestanding units with cupboards underneath or as a built in unit suitable for a barbecue island. There's something about the metallic look of Holland gas grills that I guess you either love or hate and the same can probably be said for the angular lines. But then looks aren't everything and one thing stand out above all and that that they are “Made In America!”. The Holland equipment that I've reviewed so far meets a particular market niche head on and that's the portable grill market for tailgating and camping. Certainly if this is your thing then the gas grill could just be made for you. As far as Holland Gas Grills go the Companion Propane Portable Grill is gaining one hell of a reputation with the number of satisfied customers on the increase. You could, however, be forgiven for thinking this more of an oven than a grill for the manufacturers themselves recommend you cook with the lid closed. Some people find this a little off-putting at first but once you've learned to trust your grill, you'll start producing great food. After all, you don't check the oven every 5 minutes when roasting some meat do you? A drip tray that uniquely sits between the heat source and the cooking grate. This clearly helps with point 2 but it also vaporizes the drips to create the smoke just like a flavor bar. This is a small grill, it has to be to be portable but it is no lightweight – no sir. If you are catering for yourself plus 2 or 3 others then it’s just perfect (you can always buy a bigger Weber or Charbroil Grill2Go as well if you also plan cooking for the entire neighborhood). It has to be said though that it is horses for courses so if your approach to outdoor cooking is a vision of seared steaks with lovely grill marks then the Companion isn’t for you (check out the infra red Charbroil) but if your tendency is for steaks cooked evenly on low heat then you will be a ‘happy camper’. Outback barbecue grills are probably the leading BBQ brand in the UK being sold through many of the large garden centres and when my brother in law phoned me to tell me he'd bought one I just had to get up there and find out more. I first asked him why he'd gone for Outback and he said it was because of build quality. He'd checked out other brands readily available in the UK such as Weber and Coleman but decided that the build both looked better and “felt” better on the Outback. Just more robust all round. The model he'd gone for was the 1000i which has a hot plate, grill, side burner for sauces and a rotisserie although he hasn't used the rotisserie yet, still preferring the old charcoal spit roast. Given that he already has a charcoal grill, why did he want a gas grill? “It's simply for when there's a nice evening and you just fancy slapping some steaks or chops on the barbie” was his reply. The grill is good for searing whilst the hotplate serves well of veggies, burgers and sausages. He had tried sausages on the grill but found that they just got burnt. In essence this last point really related to the split between the size of the searing plate and the grill. He finds that when it comes to those spontaneous cookouts then it tends to be easy food such as sausages and burgers. He would prefer to have a larger area for searing food. I predominantly grill over charcoal and this last comment really does make me thing whether there is one single grill to suit all occasions. Even my brother in law who confesses to not having the patience for a charcoal grill still sees that charcoal has it's part to play and he won't part with his charcoal grill. It also makes me wonder whether he should have gone for a plancha hotplate grill in the first place. So I got chance to quiz him and view his choice but not to road test it. I did go for lunch and the barbecue was alight, but it was the charcoal one! I guess that just says that given time, it's not the cooking that interests him, it's the playing with fire. I can sympathize but let's not take anything away from Outback barbecue grills. Looking at the complete range my one criticism would be that none of them have a smoke box option so I guess the popularity for smoking has yet to hit the UK. I'll keep trying.